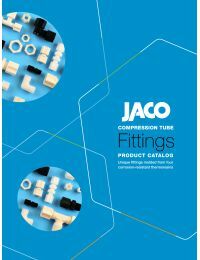 JACO 10-4-4-C-O Celcon acetal fittings have excellent tensile strength and good impact resistance over a broad temperature range. They are not affected by the continuous use of hot water and work great with plastic tubing. They are not recommended for continuous exposure to solutions with a chlorine concentration greater than 1 ppm. They are unaffected by most inorganics, except for sulfuric, nitric, and hydrochloric acids. The Celcon used in Jaco fittings is FDA listed and NSF listed for use in coffee, milk, and antibiotics.